Royal Portrush Dunluce Links Hole 2: This par five, in the right conditions, is one of the best scoring opportunities on the golf course as there is a relatively wide fairway and the green is less well guarded (the first three bunkers are set well back of the surface) by sand than many other complexes on the golf course. 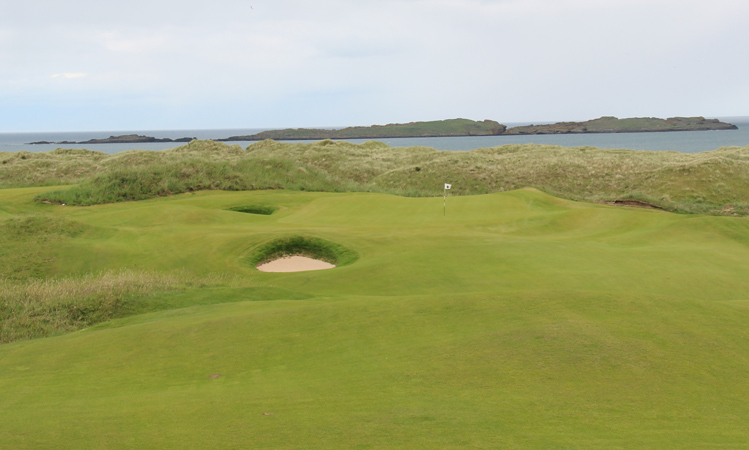 Royal Portrush Dunluce Links Hole 3: This short par three has a round green with a deep bunker to the front left and a large hump to the front right. Everything feeds from right to left on the putting surface, but there are drop offs in pretty much every way around the green. Royal Portrush Dunluce Links Hole 4: This outstanding par four has the benefit of being both long (more than 450 yards from the regular tees) and having OB right. 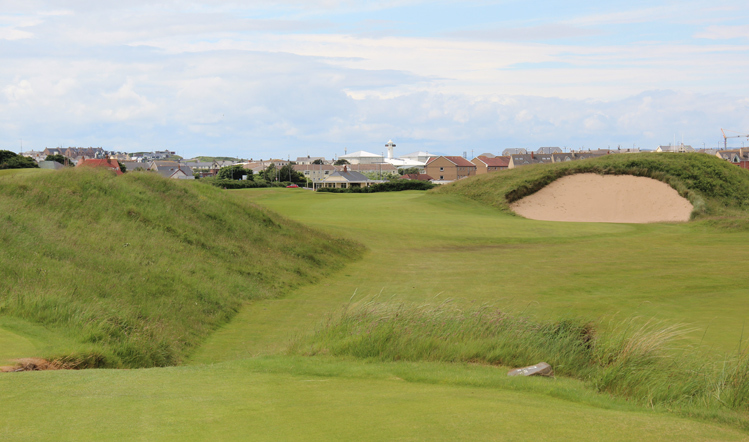 If a big drive can be hit and the fairway bunkers avoided, the approach still has to negotiate two dunes that guard the green, which angles front right to back left, making left pin placements particularly challenging as they are behind a dune. Royal Portrush Dunluce Links Hole 5: This downhill par four is not as tough as many others on the course, but it might be the most memorable as it has great views, especially from the green, which is perched above the beach and looks up the green and white cliffs of the Antrim Coast. What makes the hole also great is the green complex, which has a hump left that can feed balls onto the putting surface or long of the green, where a small ditch resides that is OB, no less than 2 feet beyond the green. So, the golfer must be careful if attacking any back pin placement. 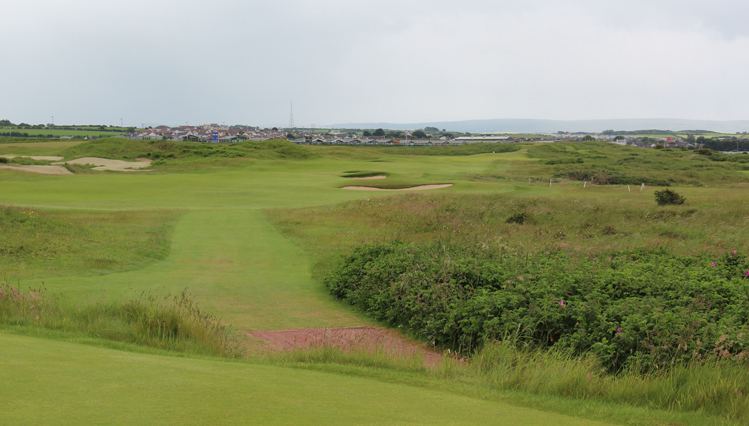 Royal Portrush Dunluce Links Hole 8: This dogleg right requires a well-placed drive around the bend in the dogleg. Trying to cut off too much is a fool's errand as the fairway is impossibly tight. 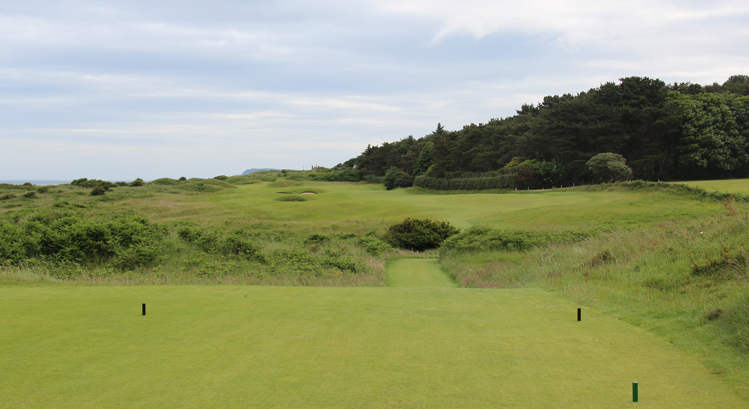 The approach shot is to a very narrow and deep green cut between dunes with a great vista for a backdrop. Royal Portrush Dunluce Links Hole 9: This par five is short but plays into the prevailing wind and has one of the tightest landing areas in golf. If the player can find the fairway, the hole can be taken to task, but that first shot is not simple. Rarely to I interject a personal anecdote, but suffice it to say, i was so terrified of the tee shot (i was playing well) that I neglected to take a picture until i was to the "wide" part of the hole, which is pictured here. Royal Portrush Dunluce Links Hole 10: Another par five that plays generally into the wind, this one has more bunkers on the first and second shots to contend with, but the green complex is fairly accessible. 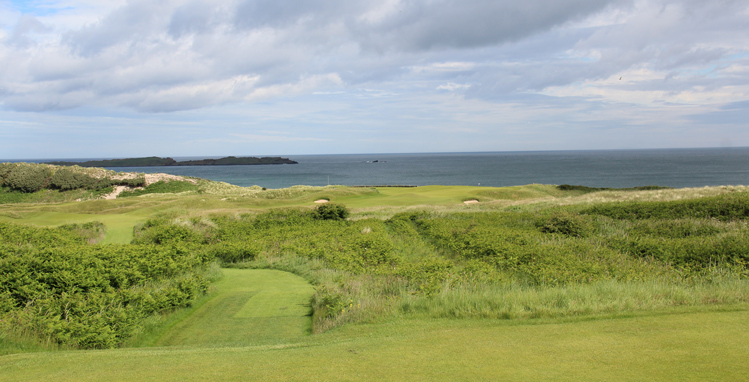 Royal Portrush Dunluce Links Hole 13: The tee shot here is uphill and generally blind, but one can see two of the three bunkers on the right hand side. 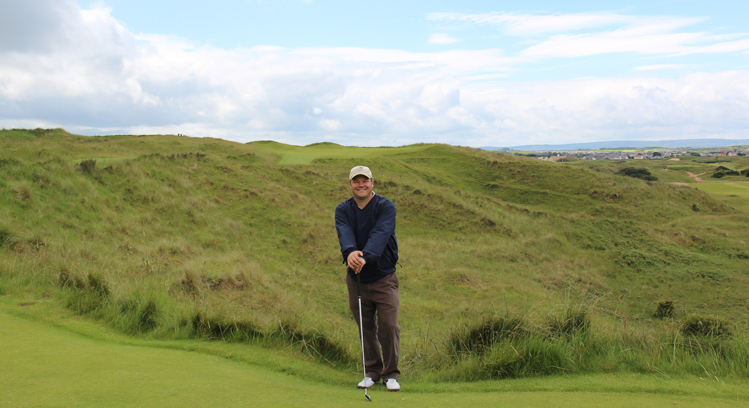 Once the crest of the hill is reached, the golfer is treated to a great view of the green complex, with a couple of bunkers and strong undulations surrounding, with a classic Northern Ireland backdrop of the Antrim Coast. Royal Portrush Dunluce Links Hole 14: The par three dubbed "Calamity" is world famous and par is truly a tough proposition. It is over 200 yards, usually into the teeth of the wind and anything right of center and short is absolutely dead. Left has "Bobby Locke's Hollow", which is a safe little bailout area to which most golfers will aim to avoid going right. Royal Portrush Dunluce Links Hole 15: Similar to number 13 in actual shot making requirements, but going in the opposite direction and into the wind, the drive is partially blind due to humps and bushes, but is not uphill and is wider than it looks. The approach, like number 13, is downhill. This green is longer but tighter and has two well-placed bunkers. Royal Portrush Dunluce Links Hole 17: The first of two finishing golf holes that are scheduled to be razed upon the return of the Open Championship, this par five features a massive bunker called Big Nellie. If that can be avoided, the rest of the golf hole is pretty negotiable.